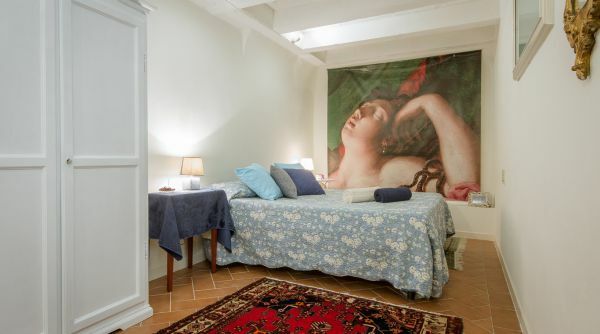 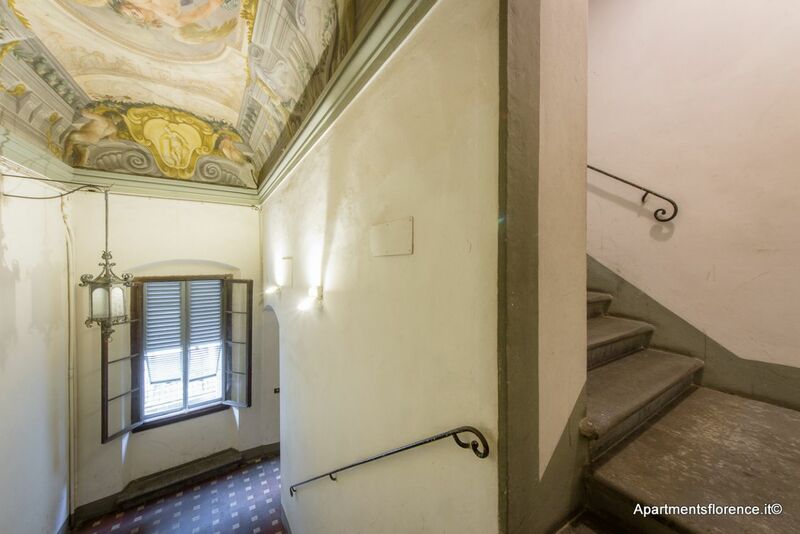 A prime choice location inside a historical Palazzo: step right into Renaissance in the heart of Florence, right around the corner from the Uffizi Gallery! 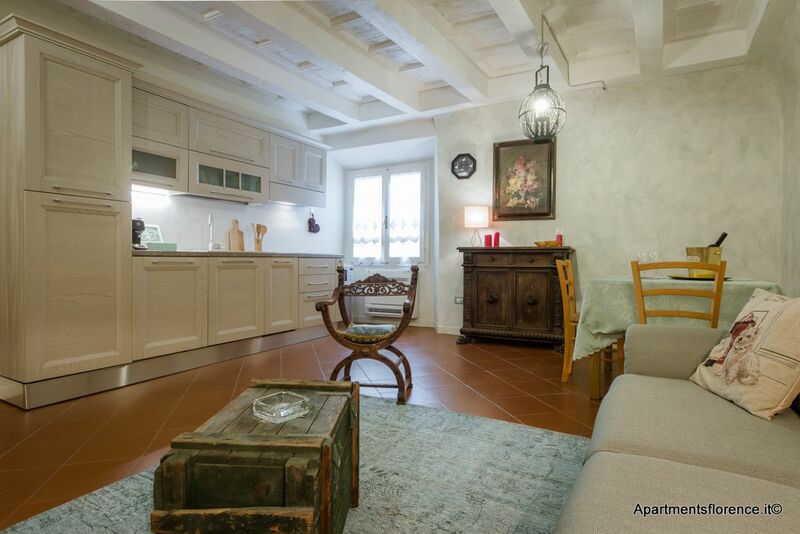 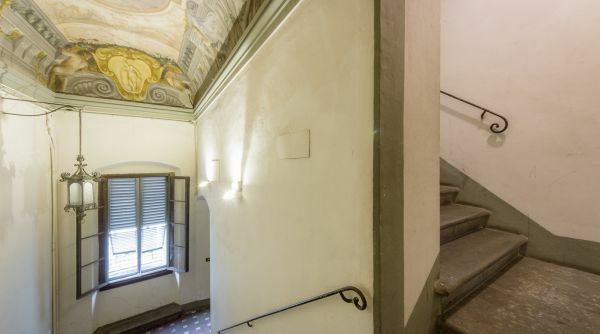 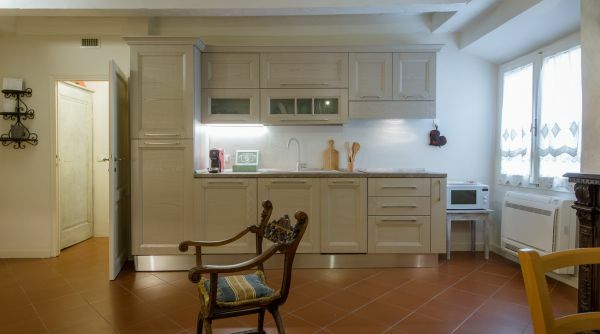 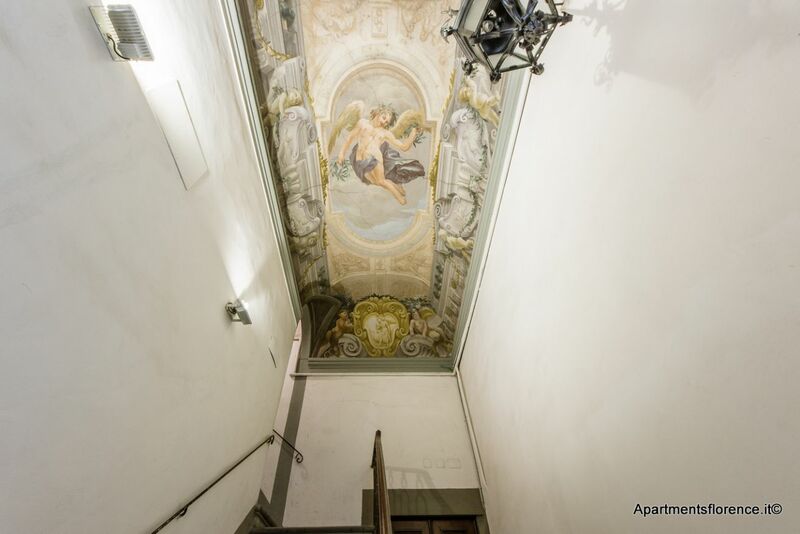 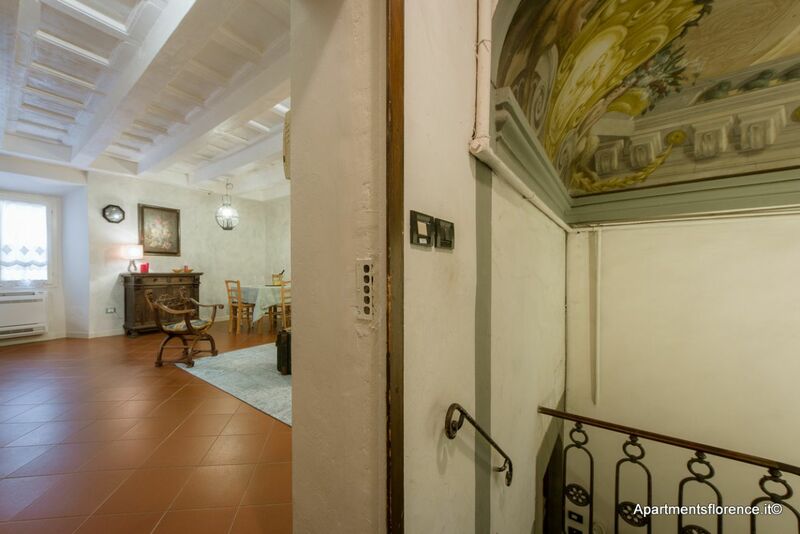 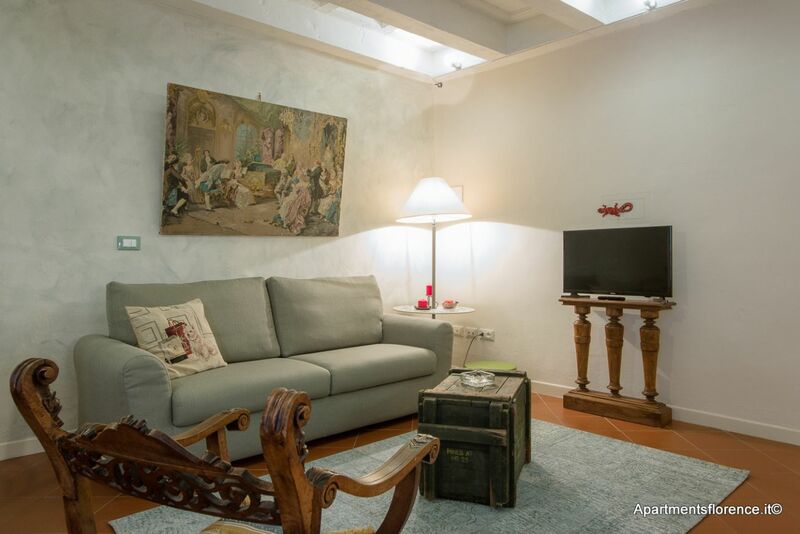 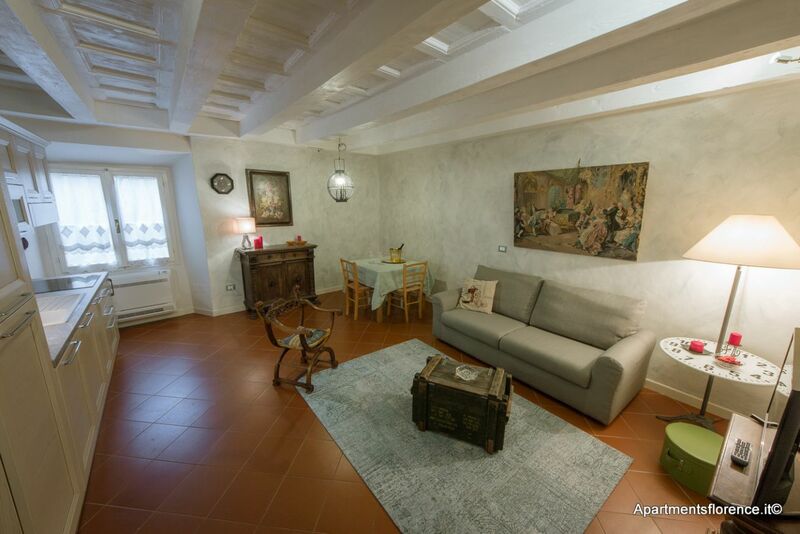 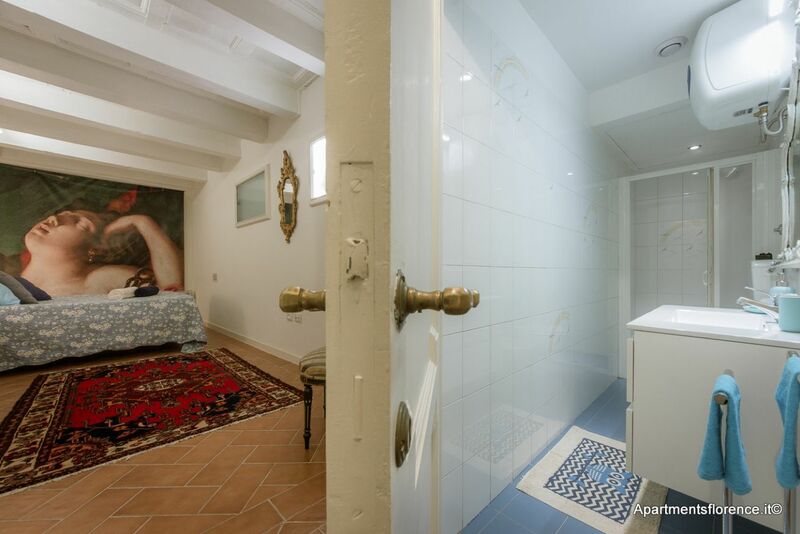 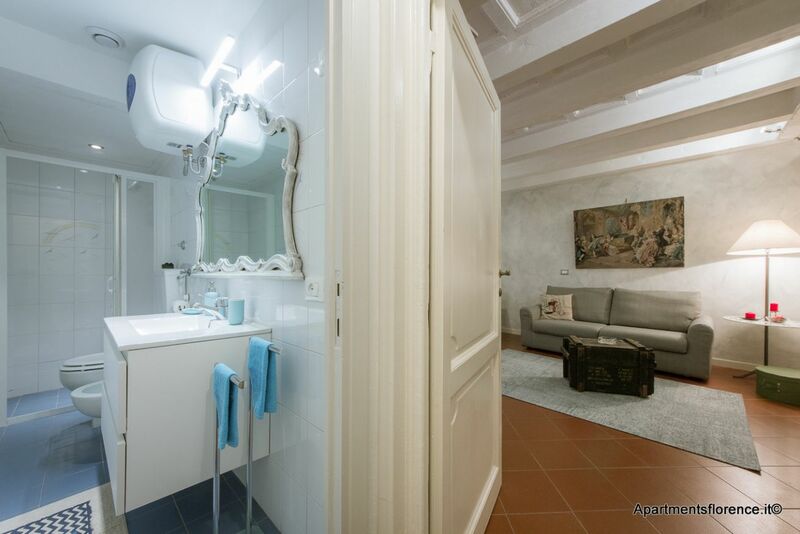 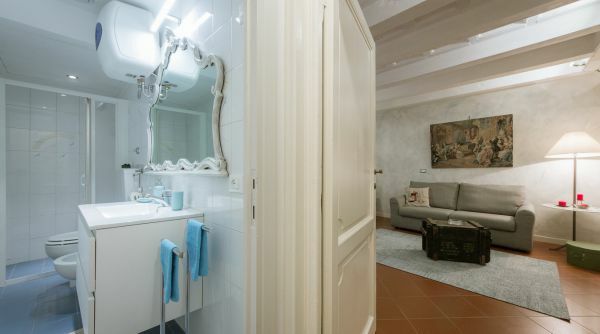 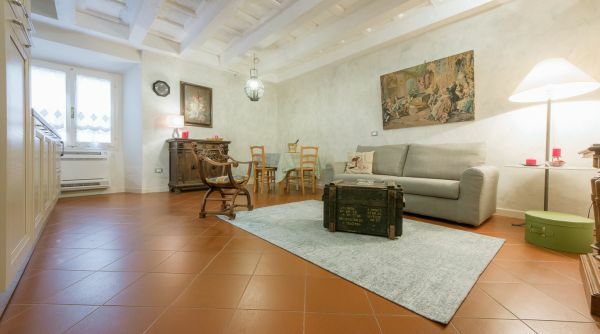 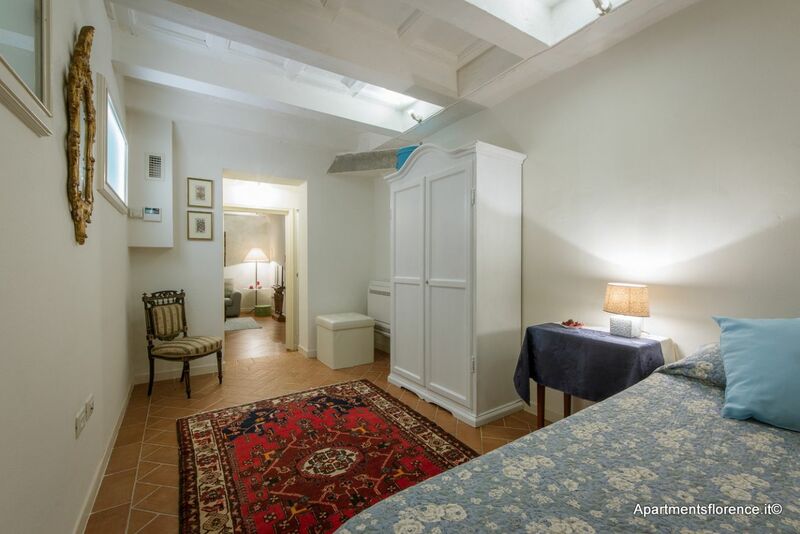 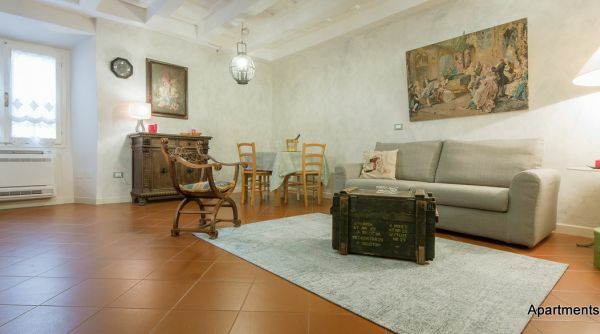 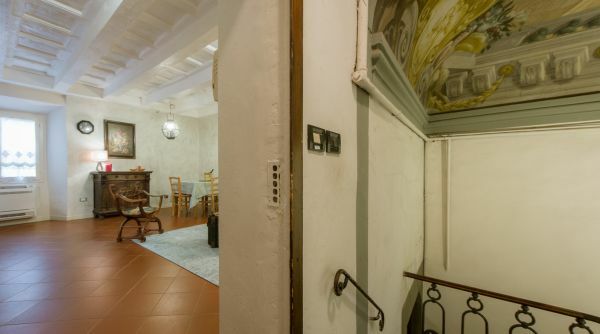 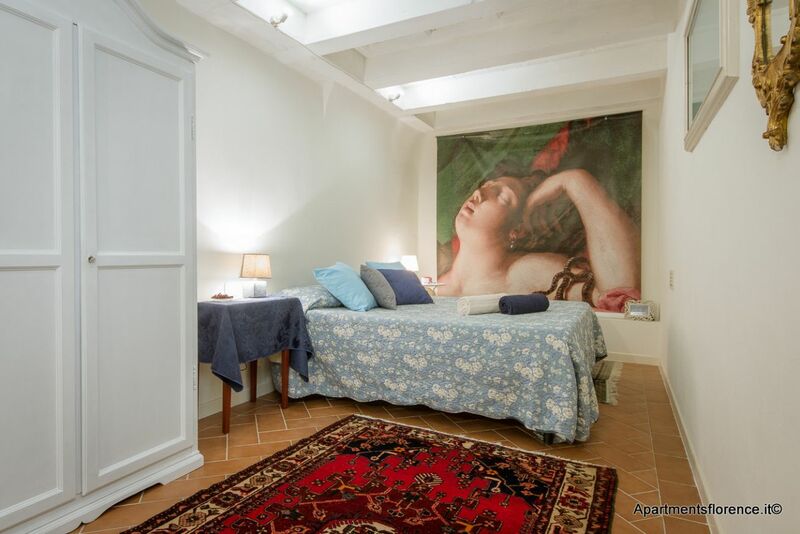 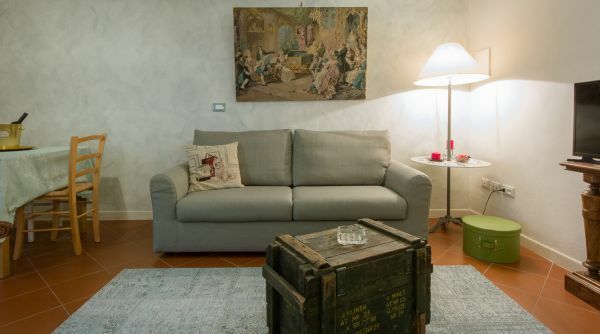 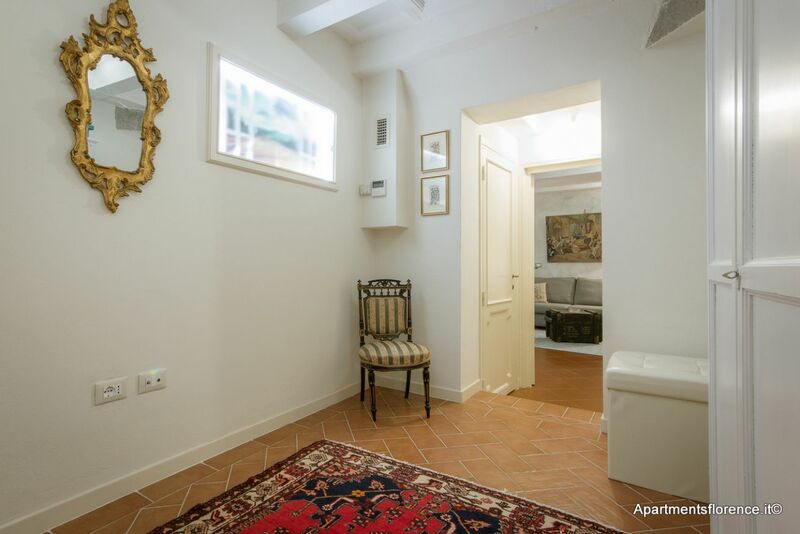 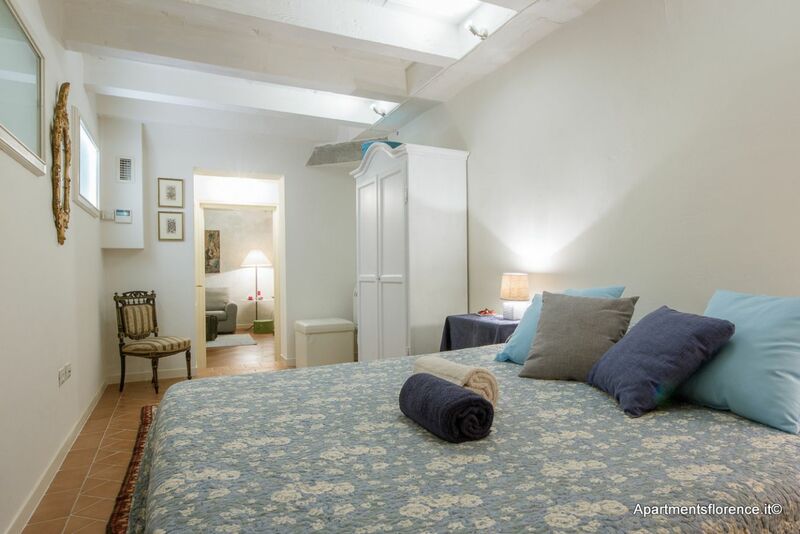 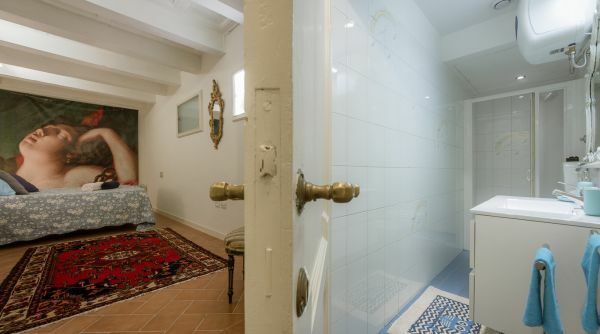 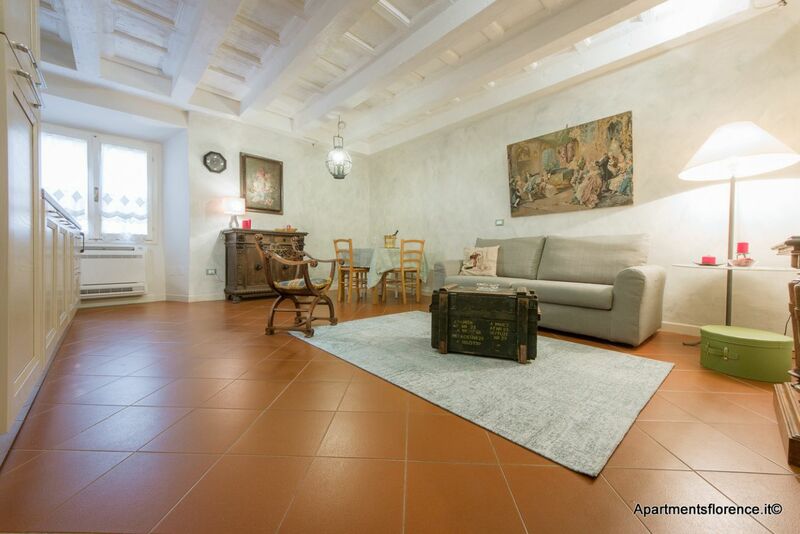 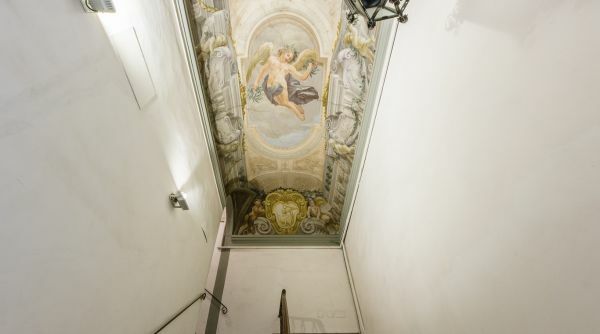 This apartment is located on the first floor of an historical Palazzo set on Via dei Castellani, right around the corner from the Uffizi Gallery, in the very heart of the city. 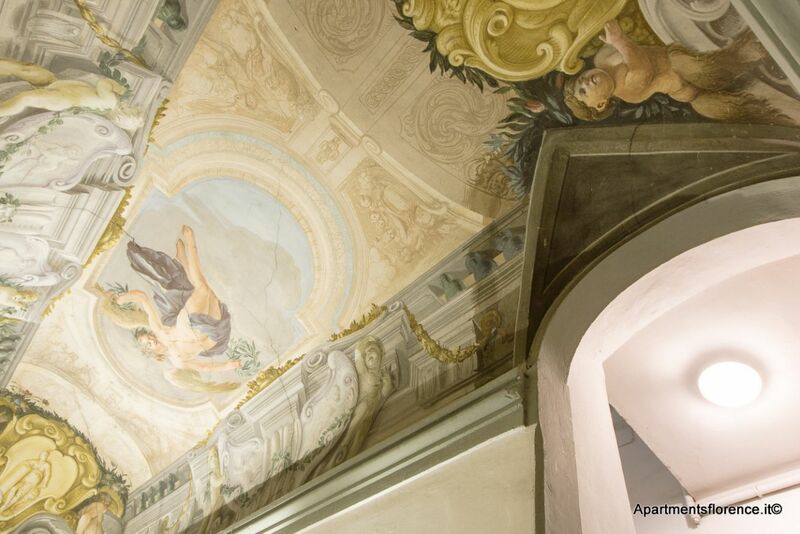 The Palace's entryway itself is a real work of art: stone staircase, frescoed ceilings, marble floors.... You'll feel as if you've stepped right into Renaissance! 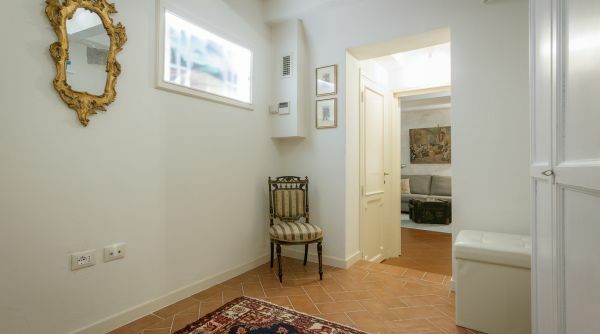 This apartment is equipped with fiber optic high speed wifi. 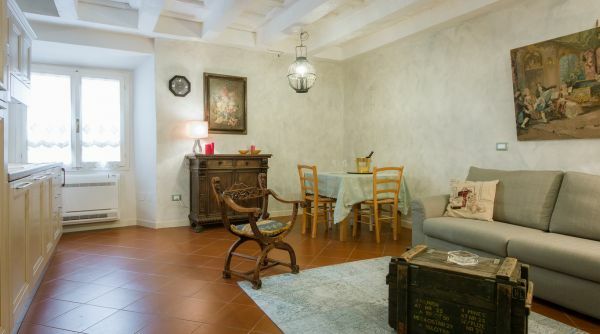 Terracotta floors, white washed exposed wooden beams along with refined interior design taste and the light color palette chosen for the furniture create a soothing and welcoming atmosphere throughout. 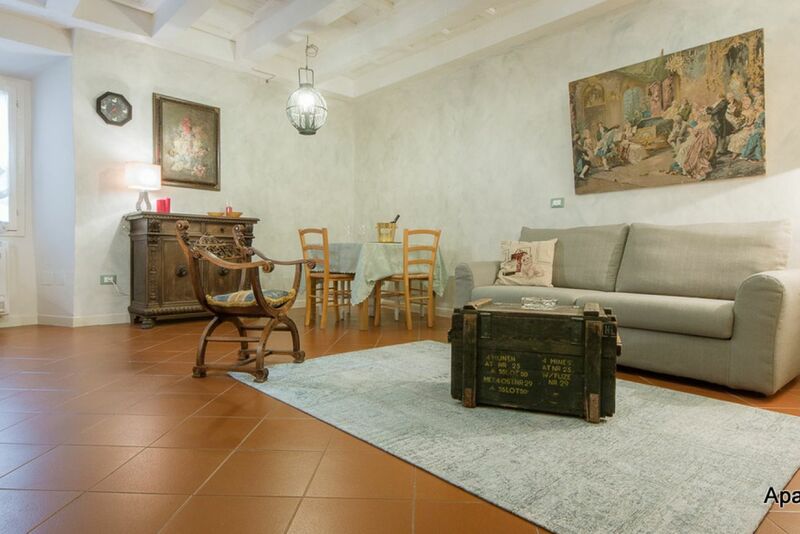 Antique items and rustic touches add a classy and chic feel to every room. 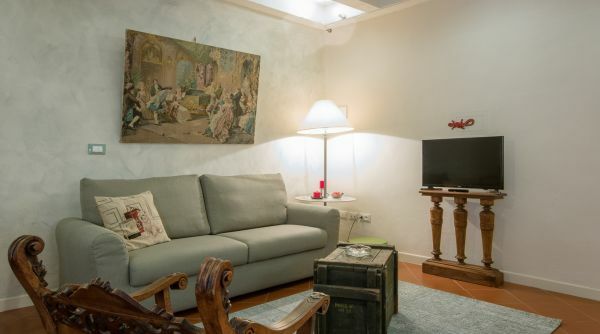 The entrance opens onto the large and bright open space living area, equipped with a modern and fully stocked kitchenette, dining table and lounge area with a cozy double sofa bed and flat screen TV. 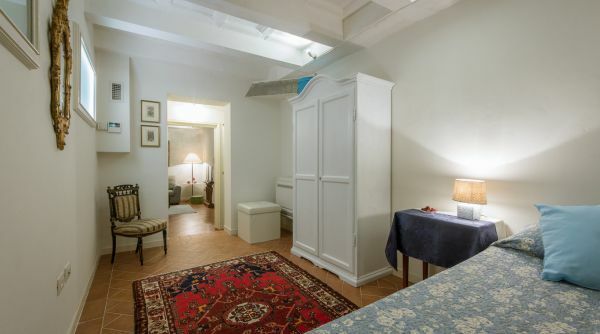 The master bedroom features a wonderful wooden ceiling and in equipped with a queen size bed and a roomy closet. 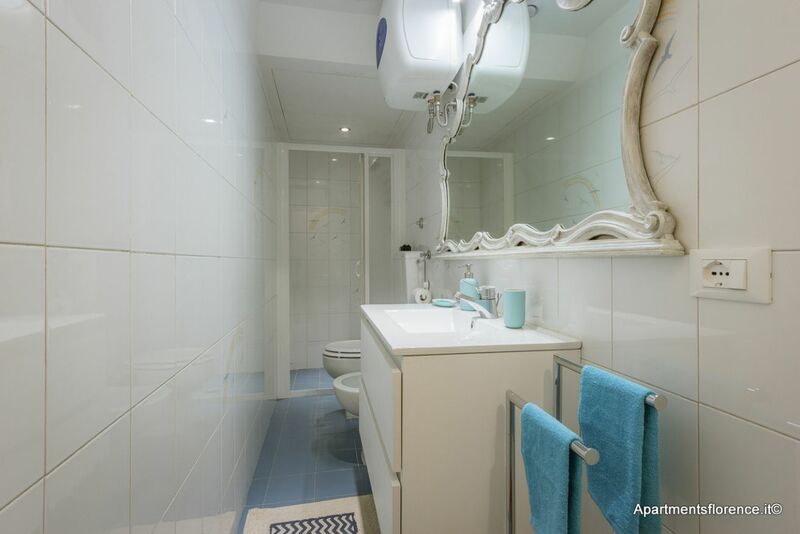 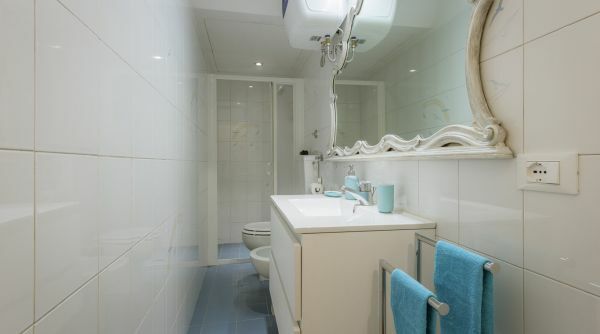 A recently renewed bathroom with walk in shower and laundry facilities completes the property. 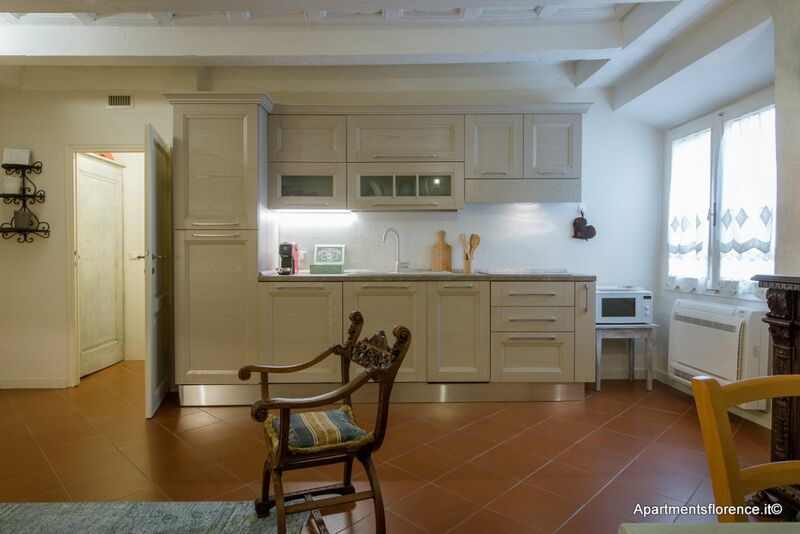 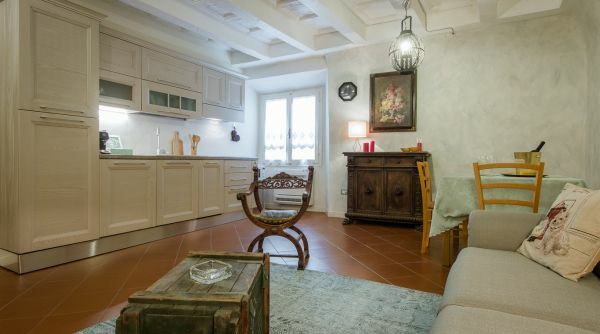 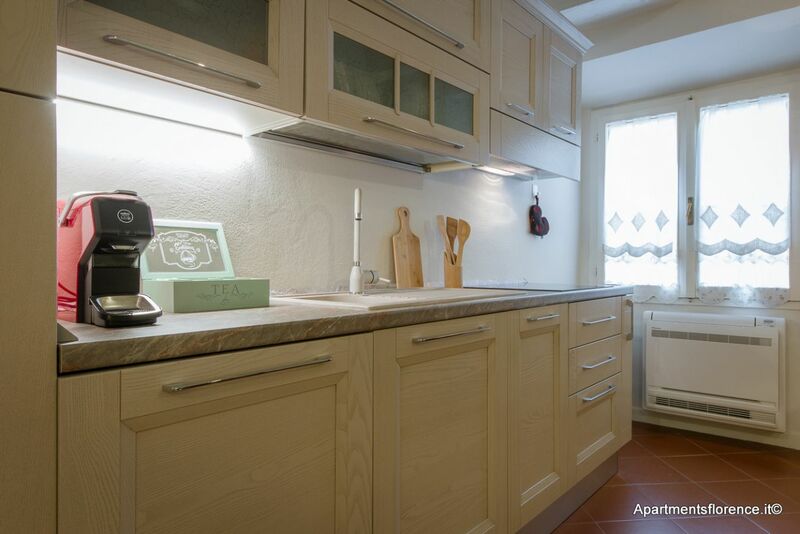 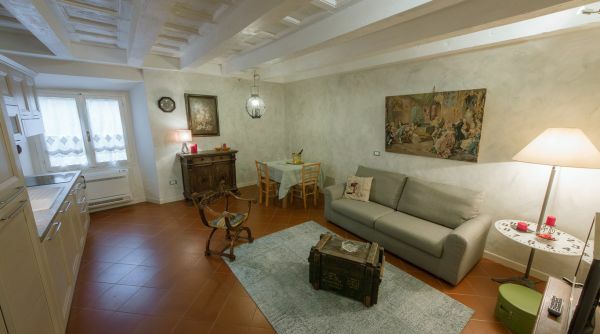 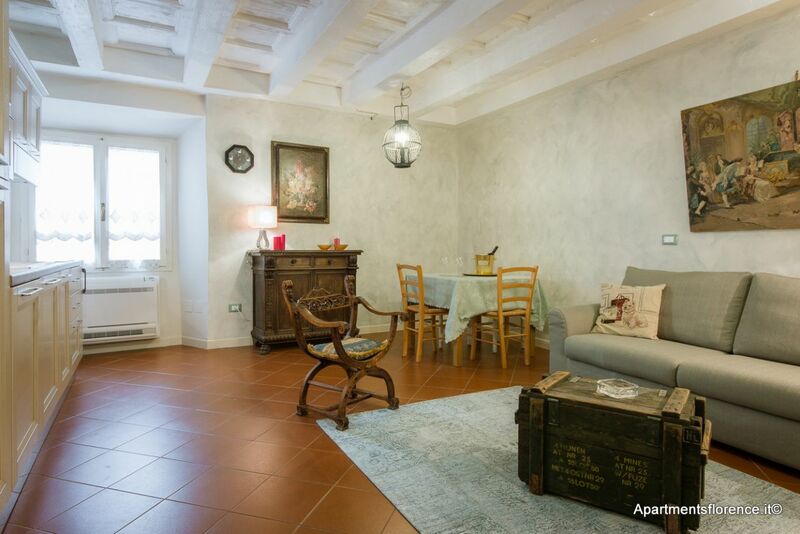 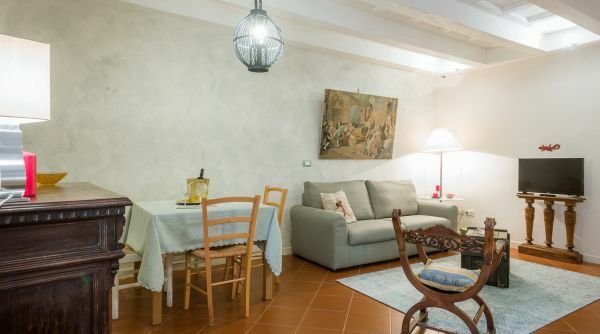 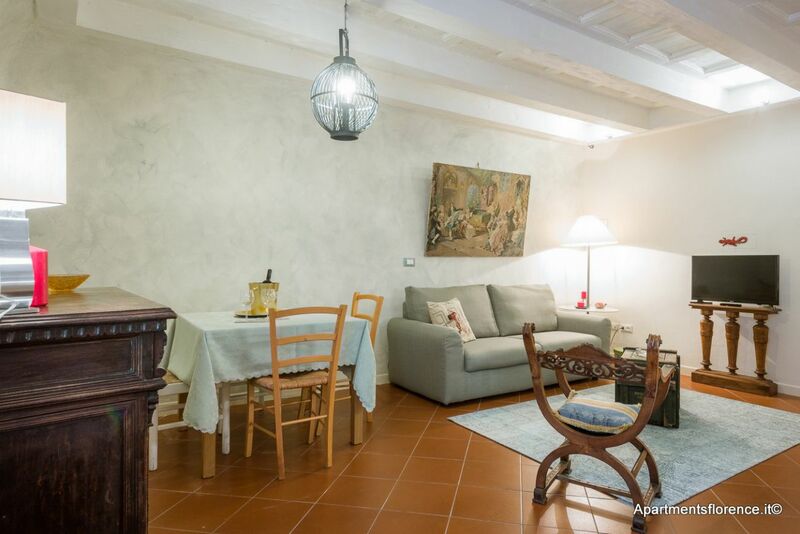 This apartment is the ideal choice for a couple looking for a charming and very well located apartment for their holiday in Florence. 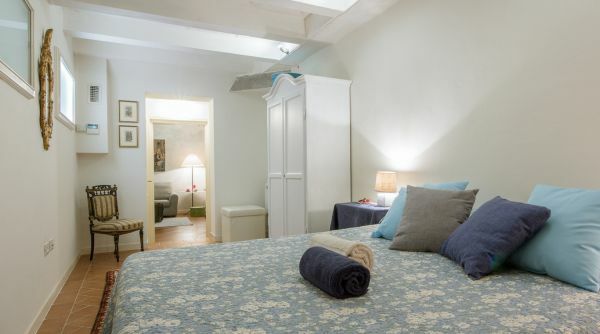 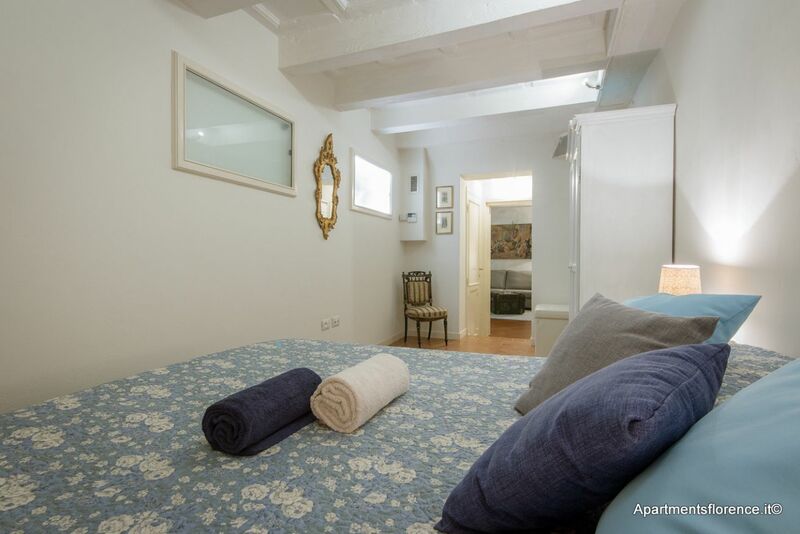 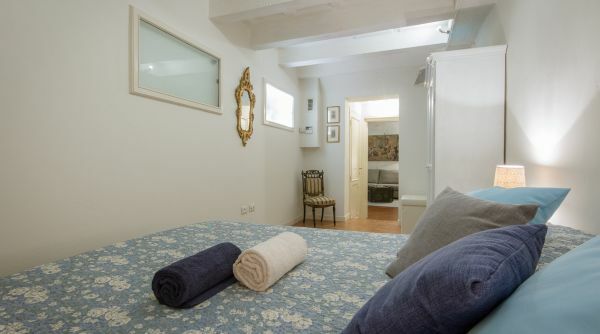 The apartment's location is ideal for those who wish to explore the whole city on foot, by day and by night, since it's nestled between Ponte Vecchio and Piazza della Signoria, a step away from the Uffizi Gallery, right in the middle of Florence's historical and artistic landmarks. 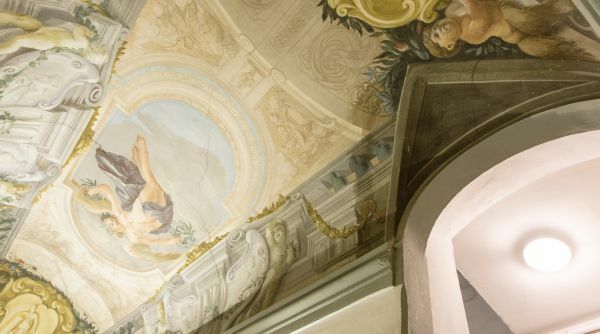 The nearby Santa Maria Novella Station is the terminus for buses, trams and railway lines, and provides easy connections with other cities in Tuscany . 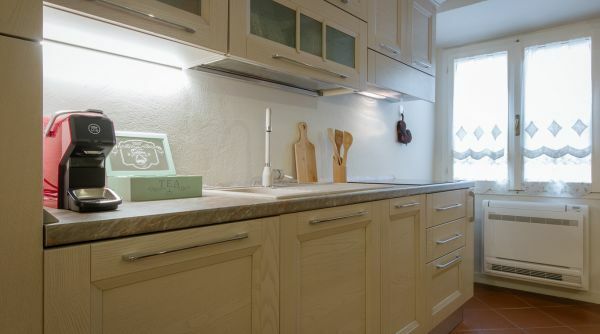 • Fiber optic high speed wifi. 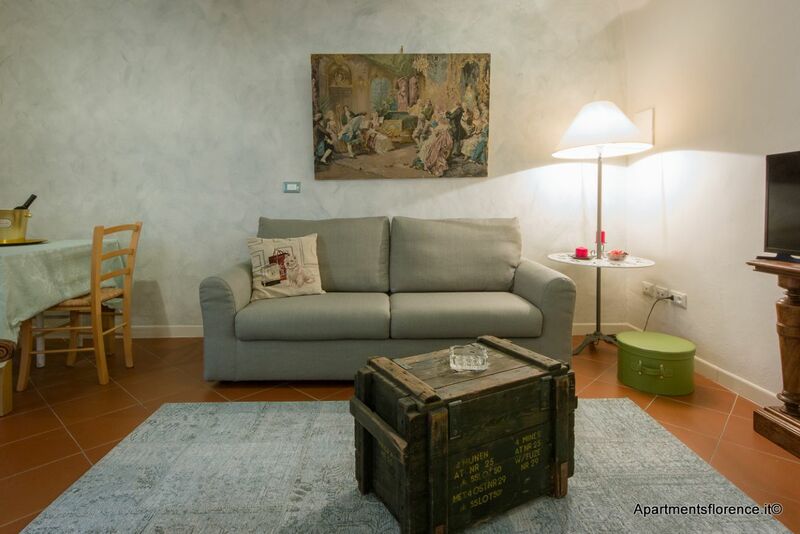 ** Please note that for this particular apartment for any stays over 30 days contract registration costs will apply.